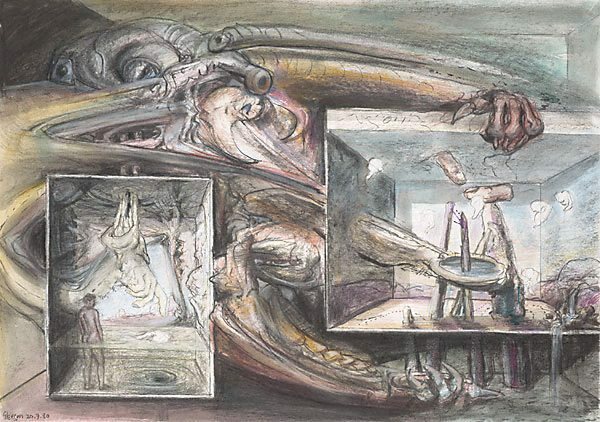 Framing an image within another, as in this drawing, was a compositional device Gleeson first used in paintings in the 1940s e.g. 'Images' 1946 and 'The perilous room' 1949. The first study for this drawing is in the AGNSW's Gleeson 'Sketchbook 1'. Hendrik Kolenberg and Anne Ryan, 'James Gleeson: drawings for paintings', Art Gallery of New South Wales, 2003, pg. 69. Signed and dated l.l., "Gleeson 20.7.80".